PAX 2 by Ploom, engineered with subtlety, performance and style in mind, holds strong as one of the top dry herb portable vaporizers! Boasting state-of-the-art controls, high grade materials, and the production of superior vapor, PAX 2 has been named the “iPhone of Vaporizers” by many. Designed 25% smaller, 10% lighter and with 30% more power than the 1st PAX, this vaporizer was made for the vaping enthusiast who prefers the sleek and discreet type who enjoy vaping with convenience! 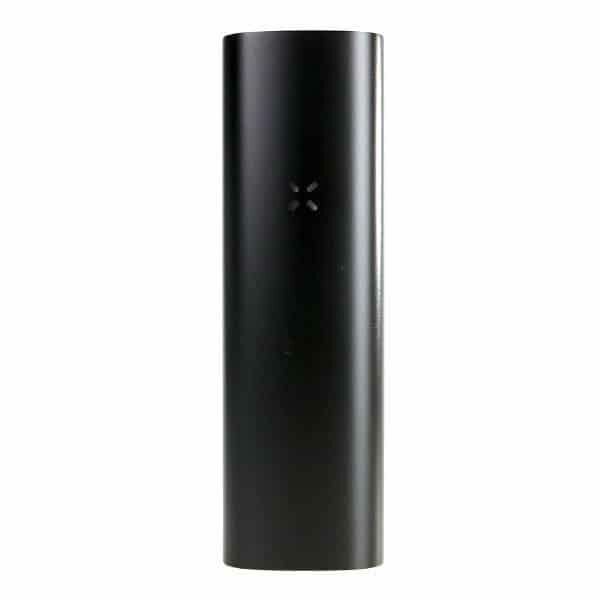 If drawing attention is not your thing, the PAX 2 is for you because now you can vape without drawing a crowd! This new design features a deeper oven, brushed anodized exterior, a flowy mouthpiece, and new and improved vapor path so it comes “dressed to impress” and it will do just that! Get ready for a full and natural vaping experience thanks to the new chamber filter which offeres improved airflow and lessens draw resistance. In addition to all the other amazing features, the PAX 2 was engineered with an advanced conduction heating system for a powerful, smooth and flavour-packed vaping session. This little gem was made for those who vape on the run! 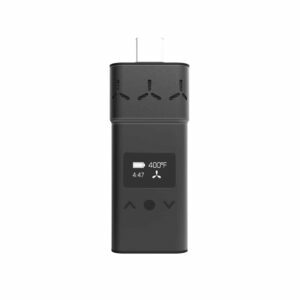 Allowing the user to master and experiment using different temperatures with extraordinary methods the PAX 2 has claimed the title of “one of the smartest portable vaporizers available today”! Boasting advanced technology which uses lip and motion sensors to alter temperatures, this vaporizer is truly one-of-a-kind. 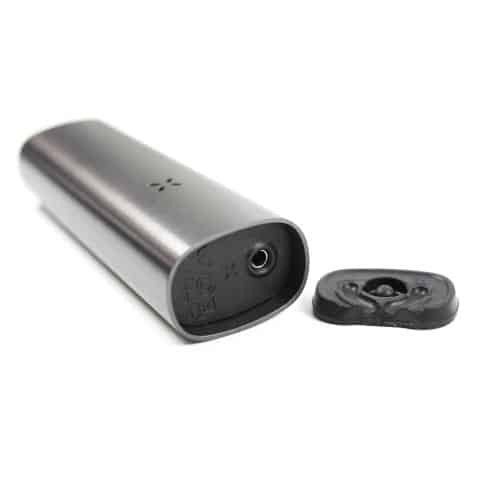 Featuring an easy-to-use single button control as well as standby-mode to conserve the battery and your precious dry herb, the PAX 2 cannot get any more user friendly. Say good-bye to time wasted on reading up on how-to-use manuals because it was designed with simplicity in mind! In virtually less than 1 minute, thanks to the powerful PAX 2 battery, you will be temp-ready and on your way to vaping sensation…now that is FAST! Simply preset your temperature (360°, 380°, 400°, 420°F) and then READY. SET. VAPE! If that isn’t already enough, watch the LED indicator lights go from purple (heating up) to green when it’s ready to go! 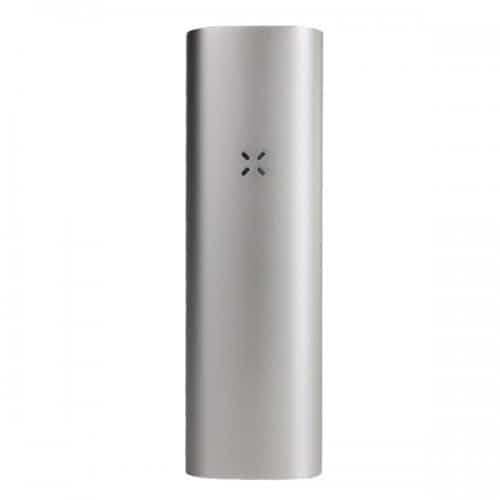 Unlike the original PAX, the PAX 2 was engineered with a stainless steel oven that is significantly deeper and narrower with a capacity of up to .40 grams. With a chamber manufactured with stainless steel, more surface area is heated so the dry herb is vaporized more consistently. For the vaping enthusiastic who likes to have options, the PAX 2 now allows you to vape with the flush mouthpiece for a sleek and discreet look OR you may choose the protruding mouthpiece if that is more your thing. The beauty is…you can pick and choose based on your mood that day! Get ready for intense flavor and smoke-free vapor thanks to conduction heating, which is also a feature of this little gem! For best vaping results, use finely ground dry herb, packed tightly, and prepare for a good 20 hits for each bowl load! Say HELLO to a longer lasting battery on the PAX 2 than its predecessor! With only 2 hours of charge time you’ll be set and ready to vape for a good 90 minutes. 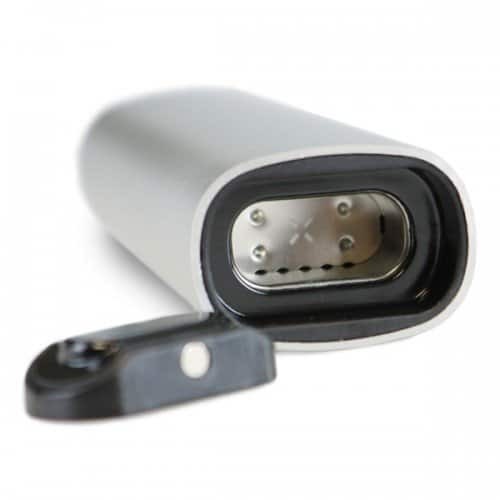 When it is time to recharge, do so conveniently, and virtually anywhere, using the micro USB charger! Also featuring an auto shut off, which kicks in when it has been stationary or has not sensed your lips for 3 minutes, you can be confident that your battery life will last even when you’re not paying attention! To prevent overheating, temperature on this unit also drops automatically after 30 seconds of sitting idle. Engineered with style and simplicity in mind, the PAX 2 is exceptionally compact so it’s discreet, portable and easy to hide in your hand, pocket or purse. Now you can vape in peace without worrying about attracting a crowd! You wanted simplicity?? No more having to think when you vape because now you can enjoy with just the push of 1 single button. Simply press down in the centre of the mouthpiece to turn on and off, and hold the button down or shake the device to toggle through temperatures! The brushed anodized aluminum surface of the PAX 2 gives it a soft, sleek texture for those who enjoy the “feel good” features. If “appearance” is more your thing, choose from 4 stylish colours-Silver, Black, Aqua and Red based on your preference! Oh wait…you like surprises? For a special feature that you have to wait to discover, simply rotate the PAX 2 3 times and wait for it! First of all the vaporizers to feature temperature adjustments based on your usage, the PAX 2 is proving it’s ahead of the trends! Boasting lip sensing technology that monitors the intensity of your draws and toggles temperature based on that information, the PAX 2 screams innovation! Larger draws will cause the PAX 2 temperature to rise and smaller draws, the temperature will decrease. This technology automatically selects the perfect temp for your favourite vaping style! IS PAX 2 FOR YOU? Made for city people, the adventurist and home dweller, the PAX 2 does not discriminate! Ideal for outdoor vaping thanks to its discreet, durable design and rapid heat up time, the superior vapor quality, and conduction heating system also make it the perfect candidate for at-home usage. It’s the power of the vapor produced by the PAX 2 that define it’s small, “fit in the palm of your hand” physique. Giving you a full 90 minutes of blissful vaping from just under 2 hours of charge time, the PAX 2 is perfect for the “busy bee” lifestyle. In a nutshell; if you’re the busy type and you’re looking for convenience on-the-go OR if you’re simply looking for top of the line vapor quality but with a vaporizer that can fit in the palm of your hand, well then say hello to the PAX 2, your new best friend! No problem at all!! Received my item in a week as described. Really happy with service and will shop again. Thx!! Perfect device for me and very knowledgeable staff for recommending this device to me. Le service fut excellent et très facile et agréable à utiliser. Cannot get anywhere near the pulls others say they do. Hi Don, make sure the tube inside the device is cleaned, residue builds up inside that tube and restricts the airflow.